.... ok, here we go. huge props go to pld and bennelong.bicyclist who've basically rewritten the firmware from scratch and mutated the thing beyond recognition, both in terms of functionality and performance. there is still a improved and enhanced quantising ASR (analogue shift register) function in ornaments & crimes, now named CopierMaschine, but several other "apps" have been added. these "apps" are selectable on-the-fly, without having to reboot the module or power-cycle. * CopierMaschine: is an enhanced version of the original quantising digital emulation of a four stage analogue shift register (ASR). * Harrington 1200: provides basic neo-Riemannian Tonnetz transformations of triadic chords, triggered by the digital (gate/trigger) inputs. * Automatonnetz: combines Tonnetz transforms with a "vector" sequencer - it can be both a chord sequencer and a melody sequencer, but not of the usual kind. * Quantermain: is a quad pitch quantiser for external voltages, with editable preset scales, even fully editable user-scales incl. microtonal tunings, etc; it can do clocked (trigger-driven) quantising, or continuous quantising, with a latency of under 100 microseconds; it also features quad Turing Machines and/or May-Verhulst logistic maps as optional, semi-random, internally generated CV sources. * Quadraturia: is a wavetable quadrature LFO, based on the "Easter egg" in the Mutable Instruments Frames module. * Low-rents: is a dual Lorenz and Rössler (strange attractor) modulation generator, partially based on the "Easter egg" in the Mutable Instruments Streams module. 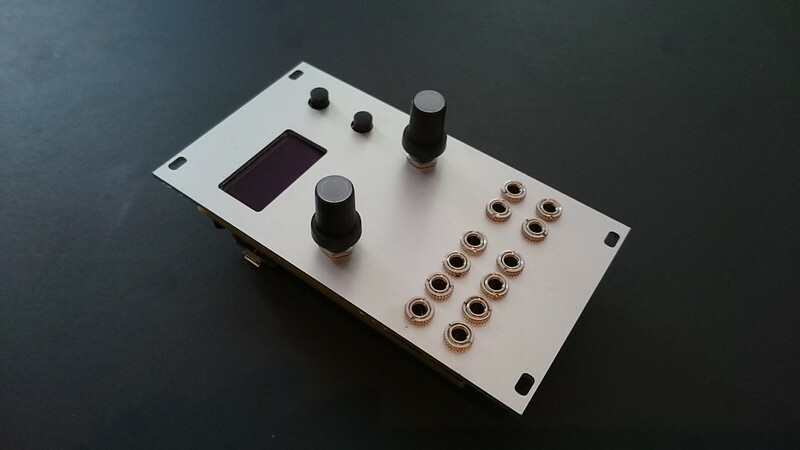 * Piqued: is a quad voltage-controlled envelope generator, based on envelope generator code from the Mutable Instruments Peaks module, but extending it with voltage control, additional envelope types, including re-triggering (looping) envelopes, additional segment shapes, adjustable trigger delays, and a unique Euclidean "trigger filter" which turns the app into a Euclidean rhythm generator which can output envelopes, not just gate or trigger pulses. * Dialectic Ping Pong: is a quad bouncing ball envelope generator, based on a hidden mode of the Mutable Instruments Peaks module. * Viznutcracker, sweet! : is a quad "byte beat" equation generator, which can be used as an audio source to generate curious but often interesting 8-bit noises and tunes, or which can be clocked by an external source to produce "byte beat" control voltage sequences. * References: is a simple utility app that outputs specific reference voltages on each channel to help tune or calibrate VCOs and other modules. - teensy 3.1 / 3.2 dev board (Freescale MK20DX256 / 32-bit ARM Cortex M4). - 4x precision CV outputs, 16-bit (TI DAC8565), output range: -3v / +6v, "in-the-loop" compensated, for best DC accuracy, with 9 calibration points at -3v to +6V per channel settable in firmware to ensure excellent linearity (+/- 1mV accuracy across a 9 octave pitch CV range is achievable). - 4x CV inputs, -3.5v / +6.5v, 12bit, 100k input impedance. - 4x trigger/gate inputs, threshold ~ 2.5v, 100k input impedance. - two rotary encoders, with built-in push switches. - 128 x 64 pixel 1.3" OLED display (with an SPI interface and SH1106 driver chip - see the build instructions). - apps use a 16.7kHz internal timer (CPU overclocked to 120MHz), therefore the DAC update (sample) rate is 16.7kHz on each of the 4 channels. - ADCs are also read at 16.7kHz but in many of the "apps" running on O+C, 16 values are averaged to remove noise, meaning that the effective sample rate for CV inputs is about 1 kHz. Digital (gate/trigger) inputs are read at 16.7 KHz - this ensures very low latency. - +/-12V power only, ca. 85mA power draw on +12V bus, much less on -12V bus). Is it possible to order boards through you mxmxmx? 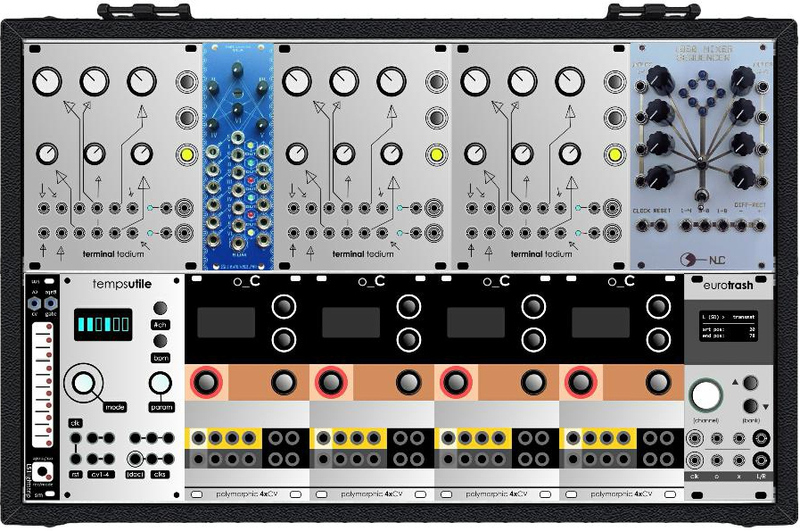 Desert island high density DIY suitcase synth. Sorry. It has changed now, just read the new manual. A long press on the right encoder at runtime enters the app selection menu. That case is a fantasy anyway. I would never use that many O+Cs in a case that small. i have a few more boards coming in sometime next week; i was hoping this week, but doesn't look like it. i can put down your name but i'm not making any promises: they're all spoken for already so it'll depend on how many extra boards they threw in, if any. we'll order more, soon. about the start-up thing: it's different from the old firmware but shouldn't have changed much in the last couple days, ie if you were using the dev version. so yeah, basically things should resume from the last active mode. the pressing buttons stuff during start-up is mostly for calibration purposes; the app-select menu on the other hand can be entered any time. For the piqued app you could implement an additional 281-mode with two AD envelopes and two of the CV outputs spitting out gates (EOR of AD1 and EOD of AD2). And for the shapes I'm sure you already had a look at the Rossum Electro Control Forge which brings the nice multi-stage envelope of the EMU Morpheus to eurorack. Lots of different shapes for the segments. Any plans of implementing more env stages with loops? Or some gate logic for conditional looping, as in Gate 1 AND Gate 3 are high -> loop Env2. YOW- ok maybe its time to finally build one of these once there is a panel. really love the visual feedback and the screen savers. do settings in the apps save between power cycles? Time to install the final firmware once I get the euro box out of the cupboard... Superb job, guys - I love both the idea and execution. New firmware uploaded - that's me occupied for the evening! Thanks to all of you for all your hard work. Nah, it's classic eurorack style. Oh, cool, thanks for the thread mxmxmx! Not automatically, but you can save settings (for all apps) and set the startup app by long-pressing the right encoder in the app selection menu. You need to deliberately save your settings: long-press on the right encoder to invoke the app-switching menu, then long-press on the right encoder again to save current settings for all apps and make the current app the default on start-up. Like Topsy, it just grow'd. What's the use-case for such EOR and EOD gates? I only ask because I'm wondering how best those types of things might be implemented. Anyway, I've captured the idea in the documentation. What sort of shapes does the Control Forge implement for its envelope segments. We can easily add more, just what type of shapes are most useful? A perfectly square gate shape will be added, BTW. Which types of envelope would be useful to loop? Piqued already has Euclidean trigger filters. It might be feasible to add some logic-based trigger or gate filters, which would achieve what you describe, I think. Shall ponder it. Voltage-controlled envelope segment shape, perhaps? A bit clumsy, but might be interesting, and quite feasible, I think. No change to UI needed, just a few more choices on the CV input mapping menu items.